Remove the engine under cover. Refer to EXT-31, "ENGINE UNDER COVER : Removal and Installation". Drain engine coolant from radiator. 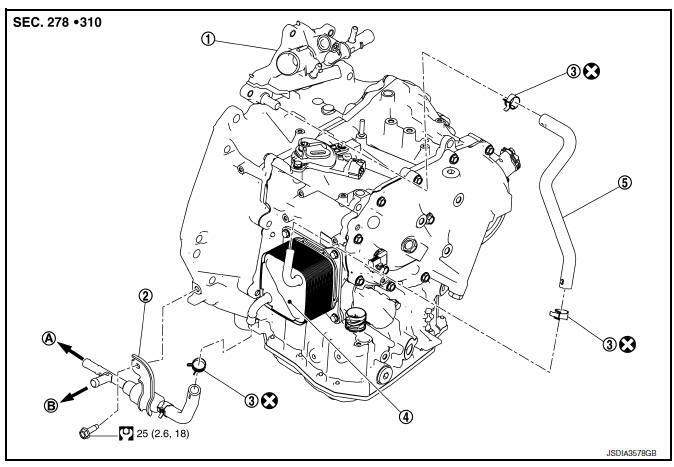 Refer to CO-12, "Changing Engine Coolant". Remove water hose and heater thermostat assembly. 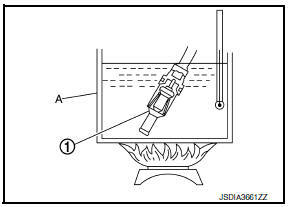 Refer to the following when installing water hoses. Refer to the followings when installing hose clamp. Do not reuse hose clamp. Hose clamp should not interfere with the bulge of fluid cooler tube. Fully immerse the heater thermostat 1 in a container (A) filled with water. Continue heating the water while stirring. Continue heating the heater thermostat for 5 minutes or more after bringing the water to a boil. Quickly take the heater thermostat out of the hot water, measure the heater thermostat within 10 seconds. 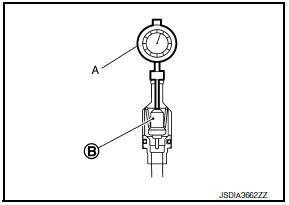 Place dial indicator (A) on the pellet (B) and measure the elongation from the initial state. Standard : Refer to TM-289, "Heater Thermostat". If out of standard, replace heater thermostat. Start the engine, and check the joints for coolant leakage.